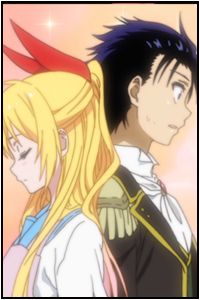 Nisekoi: False Love is a series that I heard about from my friend Bianca (as per usual, right? ), but I had also seen many images of the blonde-haired girl of the series, Chitoge. I finally got a chance to watch the first season of this anime (I believe the second season is currently in-progress as I type this), and I want to go ahead and leave you with my impressions from what I read. You can hit the jump for full details. 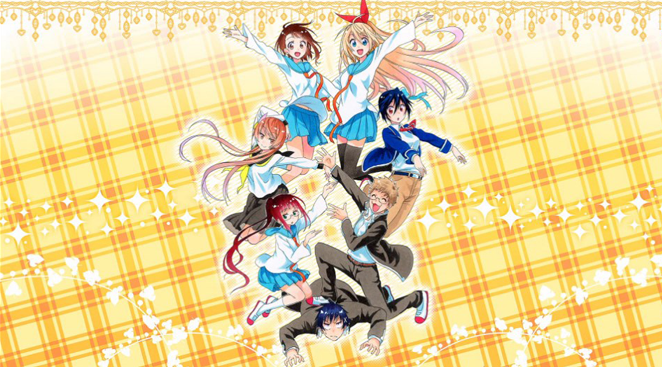 Nisekoi: False Love is a story about a boy named Raku Ichijo, the son of the infamous Japanese gang, The Yakuza. While he is living a normal high school life in the midst of dealing with who he is everyday, he longs to find the promise girl of his dreams. When Raku was a child, he met a girl whom he fell in love with who also felt the same about him. In their parting, they shared keepsakes to remember each other by, a locket for him while she had a key to unlock it. Once Raku and his love were to meet each other again and prove their bond through their keepsakes, they would be married in the future. The biggest problem with this lovey-dovey fantasy is that Raku does not remember the name of the girl, what she looks like, or where he even met her at. Sometime later he meets a girl whom he cannot stand, she barges into his school and they get off onto the wrong foot once he transfers over into his class. Come to find out that she’s the daughter of an American gang and in order to keep rivalries from brewing between them and the Yakuza, Chitoge and Raku must pretend to be boyfriend and girlfriend throughout their high school lives! The plot starts off fairly standard, telling exactly what happened in a flash back sequences which features two characters which includes the male protagonist, Raku Ichijo. It seems that the entirety of the story will focus upon this singular moment, when a boy and a girl made a promise to each other on a fateful day sometime within the distant past. The promise happened to be that they will marry when they meet again, giving each other keepsakes in order to prove that they are the ones who committed to each other. Raku carries a locket around with him which will open from the key that the girl whom he met 10-years-ago kept when they separated from each other. This will present a problem because he has no idea who the girl is or any features that would make her recognizable upon their meeting, such as her hair, eyes, face, or name. This will add the main conflict later on down the line when it comes to figuring out who exactly is his promise-girl from that sweet moment that floats around in Raku’s memory. The way that the story plays out is actually pretty nifty at the very beginning, everything is stream-lined and seems to flow well, episodes are following along with the ridiculous scenario presented at the end of the first episode which justifies the anime’s title of “Nisekoi: False Love“. However, as many more elements begins to make their way into the plot, we begin to see more “filler episodes” that do not focus upon the main plot of the story, rather they seem to act as a distraction to stretch out the story instead of willfully advancing it. 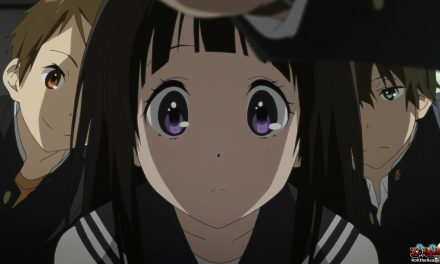 While this is fine to a certain extent since it helps to better establish all of the characters and allows the viewer to take notes of each individual personality, it can also present restless scenarios where you want to just speed up the anime in order to see the next pivotal moment within the series. To be quite honest, it seems we did not make much progress within the first season of Nisekoi outside of slowly developing the interpersonal relationships between characters, and even then the only one that actually acts as dynamic and not static is the one between Raku and Chitoge. Overall, the plot is an interesting one, but one I have already seen done before in a similar fashion (Love Hina). The characters are all different but I would have preferred that they were a bit more serious about advancing the plot while taking into account how each character plays a part in that. Things progressed a bit too slowly, but the relationship advancement of Chitoge and Raku makes for the best part of the current season and seems to have been constantly refined throughout its duration to become a keystone in the second season. They really need to also go back to prioritizing the false-relationship of Raku and Chitoge in order to grow emotions between those two. Overall, I want to see how the story will continue to progress but I want to see less fillers and more towards figuring out who Raku’s promise girl actually is. The characters of Nisekoi: False Love are each given different personalities, yet I find only a handful of them particularly interesting. To be honest, I do not even find the mannerisms of the main character, Raku Ichijo, particularly interesting either. The only person whom I am genuinely interested in is Chitoge because she seems to suffer from some major internal conflict towards the very end of the season, while Raku and the other characters seem to more-or-less know what they want, but are only hesitant about going about it. Straight-forward characters seem to make things go by a lot quicker by presenting a new twist to those that are static, but we have no characters in Nisekoi that are blunt with their emotions. Development only really happens for Chitoge within the first season. Secondary characters like Onodera or Raku’s best friend act in their own way, but they seem to only be in place to cause conflict for the main character’s personal interest. While a character like Onodera is suppose to be the sweet, kind-hearted maiden who is timid with her love (think Hinata from Naruto), all we see is a massive waste of opportunity since she is not seizing the opportunity to claim Raku for her own. Also, her hesitation is unwarranted since she knows very well he is the boy whom she is currently in love with and potential is the one who forged a promise of marriage with him. Onodera, while cute, is more frustratingly annoying to me than actually adorable due to the fact that she knows she can have what she wants but refuses to act due to being shy. While this anime had a chance to present many lovable characters, only a few had actual development shine upon them, and by a few I mean only Chitoge. This series needs to take time to develop each character while simultaneously moving forward with the plot to avoid stand-stills and delays. Right now, I am really not seeing anyone being in contention with Chitoge for Raku’s true-love, especially with the flow of things currently. I feel they really need to begin to spice things up and give Raku emotions towards each of the characters in order to create a situation where it is impossible to know what is really going on until his locket is finally opened. STRENGTHS – Pretty funny at times, Diverse range of characters, Strong back story for Raku. Nisekoi: False Love is a pretty good anime, it has a bit of nail-biter moments do to the awkward positions that characters can play themselves in, but it is balanced out by self-actualization in the way of feelings. However, it does feel like a typical drama-filled love story that is dragging out longer than it needs to in order to build more drama towards the main objective. 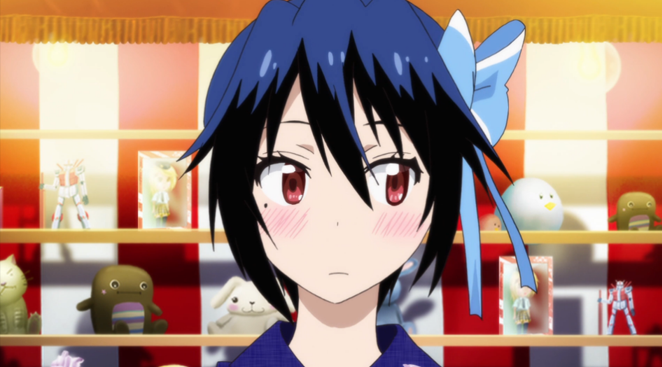 Also, the fact that I do not really have any other girl that I am rooting for besides Chitoge kind of also lessens the impact of how severe Raku’s situation is, even though he supposedly likes Onodera (considering Chitoge’s screen time and importance compared to everyone else’s). I think fans who really like love stories will be a fan of how Nisekoi plays out, especially the revelation during the very last episode. However, those who are expecting something more in the way of true romance from this series will not be particularly happy by how humor-filled things become due to character’s lack of conviction and naivete when it comes to obvious signs.